Sept 2017-present: Professor of Glycobiology. University of Southampton, UK. May 2013-Aug 2017: Principal Investigator, Glycoprotein Therapeutics Laboratory. Dec 2011-Aug 2017: University Research Lecturer. Feb 2009-May 2013: Senior Research Associate, Laboratory of Dr Chris Scanlan. Sep 2014-Aug 2017: Stipendiary Lectureship in Biochemistry, Director of Studies (Biochemistry). Feb 2017-Aug 2017: Senior Dean. Sep 2014-Aug 2017: Against Breast Cancer Senior Research Fellow. Sep 2008-Aug 2014: Fellow and Tutor in Biochemistry. Sep 2007-Aug 2008: Lecturer in Biochemistry, Director of Studies (Biochemistry). Feb 2006-Feb 2009: Post-doc, Laboratories of Prof. E.Y. Jones FRS & Prof. D.I. Stuart FRS. 2001-2005: DPhil in Biochemistry. University of Oxford, UK. In the Glycoprotein Therapeutics Laboratory we exploit the glycan modifications of proteins in the design of vaccines candidates and glycoprotein-based therapeutics. We have a particular interest in vaccine design against the Human Immunodeficiency Virus (HIV) and in the development of novel antibody-based cancer therapeutics. This involves understanding how glycans impact on protein and viral function, how they are structured, and how we they can be manipulated for therapeutic applications. Our work towards an HIV vaccine is based on targeting the carbohydrate coat of HIV that shields the virus. We have shown that this shield is different from normal “self” carbohydrates and is remarkably constant despite huge variation in the underlying protein. We have been investigating using microbial mimics of this shield to elicit antibodies that can protect against the virus. Antibodies are incredibly versatile therapeutics and can exhibit both pro- and anti-inflammatory properties. For this reason, they are being applied to the treatment of conditions ranging from cancers to autoimmune disorders. Anti-cancer antibodies often rely on the recruitment of the immune system to cancerous cells through a constant region of the antibody termed the Fc region. We have structurally characterized how different glycans can impact on Fc structure and how they can be manipulated to fine-tune antibody effector functions. In addition, we are developing bispecific antibodies and a new approach for enhancing therapeutic antibodies against cancer that involves deactivating competing endogenous antibodies that can limit the potency of anti-cancer antibodies. We are very proud to be sponsored by Against Breast Cancer. The fine structure of the glycan shiled of the viral spike of a recombinant mimic of the Human Immunodeficiency Virus (HIV). The glycans act to sheiled the virus from the host immune response but can be targeted by some individuals who develop broadly neutralysing antibodies. Therefore, much effort is being made in trying to develop vaccines candidates that contain glycans that mimic those found on the virus. The high density limits the natural processing of glycans from oligomannose structures (green) to complex-type glycans (pink). Left: The processing state of the individuals has been depicted on a model of the glycosylated trimeric spike. Middle: The trimeric structure limits processing and leads to an elevation of oligomannose-type glycans at the protomer interface. 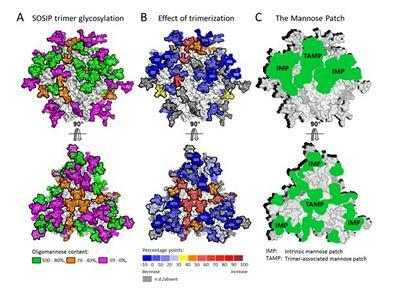 Right: the ‘mannose patch’ of HIV can be described as being composed of both an ‘intrinsic mannose patch’ where oligomannose glycans appear even when monomeric subunits are expressed in isolation, and a ‘trimer-associated mannose patch’ that is driven by the trimer structure. Giabbai, B., Sidobre, S., Crispin, M., Sanchez-Ruìz, Y., Bachi, A., Kronenberg, M., ... Degano, M. (2005). Crystal structure of mouse CD1d bound to the self ligand phosphatidylcholine: A molecular basis for NKT cell activation. Journal of Immunology, 175(2), 977-984. Arnold, J. N., Radcliffe, C. M., Wormald, M. R., Royle, L., Harvey, D. J., Crispin, M., ... Rudd, P. M. (2004). The glycosylation of human serum IgD and IgE and the accessibility of identified oligomannose structures for interaction with mannan-binding lectin. Journal of Immunology, 173(11), 6831-6840. Supernumerary Fellow, Oriel College, Oxford. 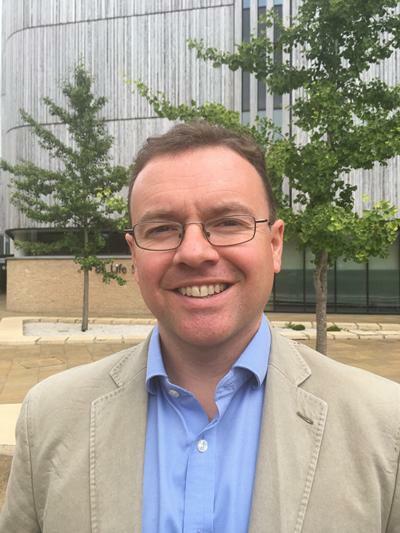 Professor Crispin founded Immago Biosystems Ltd with Chris Scanlan in 2013. They invented a method to boost the cell killing activity of antibody-based cancer therapeutics. This has subsequently been shown to be effective in a variety of model systems including in human sera (ex vivo). Immago was subsequently acquired by Hansa Medical in 2016. Professor Crispin performs consultancy for a range of biotechnology and legal firms principally in the area of glycoprotein-based therapeutics.